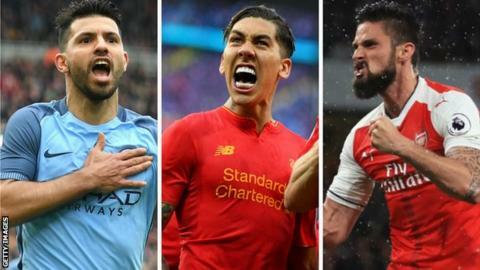 Manchester City, Liverpool and Arsenal all face a possible play-off to determine qualification for next season's Champions League. The three clubs, occupying third to fifth place in the Premier League, are separated by three points going into Sunday's final round of games. But their goal difference, and goals scored, are similar enough to raise the prospect of two teams finishing joint third or fourth with identical records - necessitating a one-off play-off match. However, bookmakers are clearly not convinced. Of three possible scenarios where a play-off would be required, the one with shortest odds is around 595-1. The top three teams qualify directly for the Champions League group stage, with the fourth-placed side entering at the preceding play-off round, while the fifth-placed side will enter the Europa League. Quiz: How well do you remember this season? How do they stand at the moment? Premier League rules state: "If at the end of the season either the league champions or the clubs to be relegated or the question of qualification for other competitions cannot be determined because two or more clubs are equal on points, goal difference and goals scored, the clubs concerned shall play off one or more deciding league matches on neutral grounds, the format, venue and timing of which shall be determined by the board." Last season, there was a chance that Liverpool and West Ham could have finished with identical records with a Europa League place at stake. So, how could it all happen? This would require a high-scoring draw for City at Watford, while Liverpool give relegated Middlesbrough a thumping at Anfield. The sides would also be locked together with identical records if City drew 4-4 and Liverpool won 4-1, and so on. However, Arsenal cannot affect this scenario - even by winning, they could finish no higher than fifth. Manchester City v Arsenal: Doomsday scenario for City? By contrast, a heavy defeat for City raises the spectre of finishing level on points with Arsenal. The same permutation would be reached if City lost 5-1 and Arsenal won 2-1 - you get the picture. What makes this scenario even more complicated is that it could produce a third/fourth place play-off if Liverpool fail to beat Middlesbrough - or a fourth/fifth place play-off if the Reds win at Anfield. The final scenario would leave Liverpool and Arsenal fighting for fourth place on the most perilous of knife-edges since they battled for the title on the final day of the 1988-89 season. Other combinations of results which would leave the sides level would be a 2-2 Arsenal draw coupled with a 3-1 Liverpool defeat, or a 3-3 Arsenal draw if goal-shy Boro win 4-2 at Anfield, and so on. The good news for Manchester City fans is that under this third scenario, they would finish third, whatever their result at Watford, and clinch that cherished Champions League group stage place. Liverpool & West Ham Europa play-off?